rare is the occasion when i cook something without thinking of my mother in one way or another. with every movement through the kitchen, every stir of the spoon, i hear her voice, telling me what she is doing and why, as a much younger me watches or helps her cook for her husband, eight children, and whatever friends and family might be in the house at that moment. so.. each week i will try to highlight a lesson whose source i otherwise may have forgotten... things i am grateful my mother taught me about cooking. it's so easy. but it's the kind of thing that when you haven't done it in a while, and your recipe states, "break cauliflower into small florets," you find yourself staring down a ginormous brain-like head of cauliflower. but don't despair, you can do this! my mom used to make cauliflower by steaming it in milk. as a child, this was pure magic to me. cooking for eight children, my mom was a frugal cook. if milk was leftover from cereal or glasses in the morning, it was put away in a separate bottle in the fridge, as "cooking milk" for baked goods. so seeing my mom use FRESH milk to cook the cauliflower showed me that cauliflower is truly special. broccoli - you could make with water. 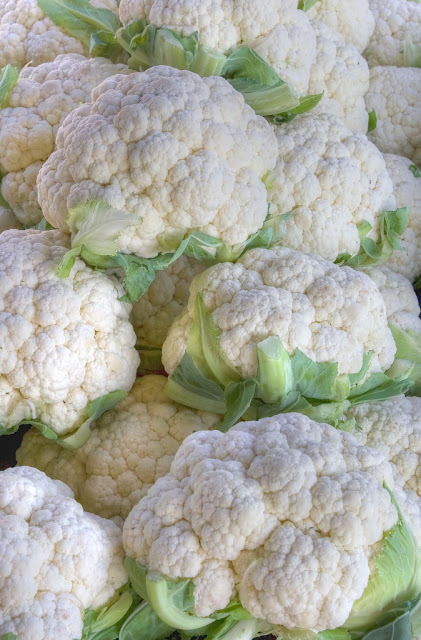 but cauliflower, it must have been extremely precious if you steamed it in milk. step 1: peel away the leaves (do not discard them, set them aside) and quarter the head of cauliflower. step 2: cut the thick central stem away from the cauliflower at an angle (do not discard the stem, set it aside). step 3: break the cauliflower into florets, in similar size to the other things you are cooking or as dictated by your recipe. see? florets! you've done it! yay! sneak peak of my rosemary sage roasted sausage and veggies recipe to come soon! now what about all those bits and pieces of the thick stem and outer leaves you set aside? that's foooood, people! if you are living on a budget, or trying to eat healthy, or trying to be green, or just into trying new things, you might want to save these bits and pieces instead of dumping them into the trash bin or the compost heap. you can dice them up and saute them, or shred them and make them into cole slaw (which is what i will be doing!). i don't have a recipe for you yet, as this bag of goodies is still sitting in my refrigerator, but this recipe from lauren's latest looks good. and, if you are interested in learning about getting more from the food you eat, this is a great article from the NY Times about Ann Elder from the Community Farm of Ann Arbor. question... did your mom steam cauliflower in milk? or am i the only one?